Setup the max speed authorized and the app will alert you alert you in a visual and sound way that you are speeding . 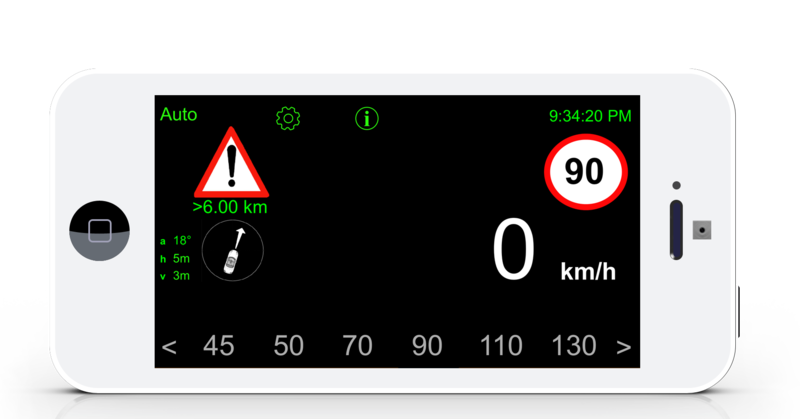 The app allows you to memorise the different speed limits encountered on your route. When you go back on the same place and in the same direction, Zotr will remount automatically the speed limit panel. You can also memorise the danger zones met on the road. If you go back to the same place later, the app will alert you in a visual and sound way the closeness of the danger. With audible alerts, you’ll be less watching your vehicle’s speedometer and paying more attention to what’s going on on the road. You do not need Internet connection on your smartphone. The app will check your speed and recall you the closest danger zone. You can save the stored points and share them with your friends.